Sometimes it makes more sense to rent than to own. 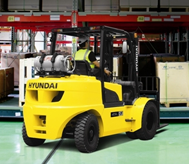 We offer convenient and affordable forklift rentals on a daily, weekly, monthly or long term basis. You can even try a forklift before you make the commitment to purchase. We offer many makes and models to choose from. Miramar Forklift will even help you decide what type of lift works best for you. Battery or gasoline, conventional or special operation. We've got your answer! We can assist you or your staff on the operation & maintenance of our lifts.